Virtually every editing or audio mixing set-up uses audio monitor speakers — most often sitting on the either side of a computer monitor on the desktop. In these scenarios, the physical transfer of vibrations from the speakers to the desk’s hard surface can create a boost of mid and low frequencies. This is called vibration-loading. Vibration-loading means the user can hear a combination of direct sound from the monitor speaker and the effects of structural resonance — a distortion of the original recording. If mixing and equalization decisions are made based on what is heard in this kind of situation, the mix may be absent of low and mid-range frequency content when the audio is heard on other reproduction systems. Speakers need to be isolated from the hard desk surface to supports them. 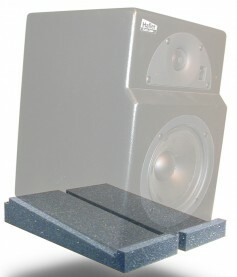 Primacoustic’s IsoPads, called IsoWedges and IsoPlanes (both $39.99), are popular foam solutions for isolating monitor speakers. IsoPads consists of four pieces of high density, low compression polyurethane foam, enough for two loudspeakers. Each piece measures 12.75-inches by 4.5-inches and available is in two profiles. These foam panels help reduce comb-filtering that occurs when various frequencies add or cancel with each other when coupled. The IsoWedge is angled, while a variation, the IsoPlane, is flat. This allows the user to select between platform shapes to optimize their studio setup. The IsoPlane can also be used to decouple turntables and other devices that can be adversely affected by sound resonating through the floor and furniture. Sold in sets of four units, the IsoWedge and IsoPlane are designed to be used in pairs and spaced under the monitor as a means to distribute the weight. The cost effective design makes them ideal for home studio use and other applications where vibrations are an issue and decoupling is required. The IsoWedge is cut with a six degree slope and is intended to accommodate meter bridge or tabletop mounting where the monitor speaker will need to be aimed up or down for the best on-axis positioning. The IsoPlane is cut with a planar profile making it useful for isolating equipment that requires a level surface such as turntables and CD players. Some monitor speakers, including those from Genelec, include IsoPod foam wedges. Also making alternative for speaker isolation pads is Auralex, IsoAcoustics, Ultimate Support, Adam Hall and Auray. 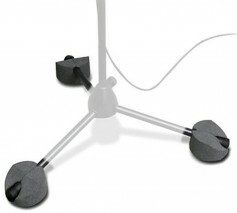 A more expensive solution are Primacoustic Recoil Stabilizers, a speaker mounting device that eliminates disruptive resonant coupling from the loudspeaker to the stand. It also provides a stable base that reduces the recoil caused by the forward energy of the loudspeaker motion. The Recoil Stabilizer ($89.99) combines three basic components, including a high-density urethane foam base to isolate the speaker from the shelf, monitor-bridge or stand, a heavy quarter-inch laser-cut steel plate and a thin neoprene top surface. The foam effectively decouples the loudspeaker to eliminate vibration-borne resonance that invariably introduces phase anomalies, while the steel plate introduces significant mass to the structure, stabilizing the speaker. The no-slip surface coats the top to ensure the monitor stays firmly in place. By reducing the backward “recoil” as the speaker coil pushes energy forward, the initial transient no longer suffers lag and the sharpness of the resulting impulse is more defined. Upon first listening with these devices in place, the user immediately notices more punch and extended low end. Upon further listening, one begins to notice greater detail at all frequencies, improved transient response and more defined depth of field. This not only makes mixing easier, but since the Recoils eliminate unknown resonance from contaminating the sound, mixes immediately translate better to other rooms and audio systems. Isolation goes beyound monitor speakers. 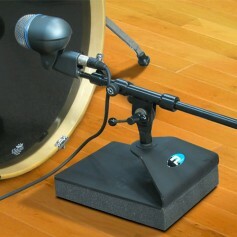 Primeacoustic also makes isolators of microphone stands (TriPad, $19.99) and the KickStand bass drum mic stand ($74.99). These accomplish the same thing, protecting the microphone from mechanical vibration noise and reducing low frequency reflections.